Only four of those were classified as serious by the Pipeline and Hazardous Materials Safety Administration (PHMSA), and none involved injuries. So they didn't even approach the human tragedy caused by a runaway oil train in Quebec earlier this month. But the jump highlights a side effect of crude oil production growing faster than pipeline capacity: more rail accidents. Much of the increase involves crude shipments from North Dakota, where booming Bakken Shale oil drilling is producing more oil than its limited pipelines can transport. The number of oil-filled tank cars moved by rail jumped from about 10,000 in 2009 to more than 230,000 last year, according to the Association of American Railroads. Crude, though, still accounts for only about 1 percent of rail traffic. "What that's really doing is tracking the spike in car loadings," Peter French, a safety expert with the rail association, said in an interview. But critics argue that as the crude-by-rail business balloons, safety considerations aren't keeping up. Greenpeace Canada energy campaigner Keith Stewart says there are concerns that the number of heavy, oil-laden cars might be causing increased wear on tracks. And he says the U.S. and Canada should no longer allow the use of older tank cars, which are too susceptible to puncture in a derailment (EnergyWire, July 10). "You're really rolling the dice," Stewart said. Overall, the number of hazardous material accidents along the nation's railroads has remained steady, with a slight decrease, since 2000. And rail industry officials vigorously defend their safety record, saying rail is a safer way to transport oil than pipelines. Pipeline advocates say pipelines are safer than rail. As recently as 2005 there was only one railroad mishap involving crude oil, according to PHMSA's Hazardous Materials Incident Database. The number jumped up to eight in 2008 and back to one in 2009. But then it started increasing. There were nine incidents in 2010. 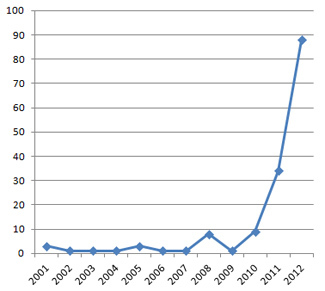 That more than tripled to 34 in 2011 and then more than doubled in 2012 to 88. French said only six of those resulted from a train accident, such as a derailment. The rest were classified as "nonaccident releases," such as leaking valves or vents. The amounts involved are fairly small. In 2011 and 2012 there was less than 4,000 gallons spilled nationwide. But this year, one rail accident far exceeded that. A 14-car derailment in March near Parkers Prairie, Minn., spilled 15,000 gallons of Canadian oil. That's more than the previous three years combined. North Dakota was the origin of 26 percent of the rail shipments that had incidents last year, more than any other state. But only two incidents happened in North Dakota. More spills happened in Texas and Louisiana, big refining states, than any other state.